Reporters on a Yorkshire weekly are using a cafe to meet members of the public about news stories after their offices were closed down. 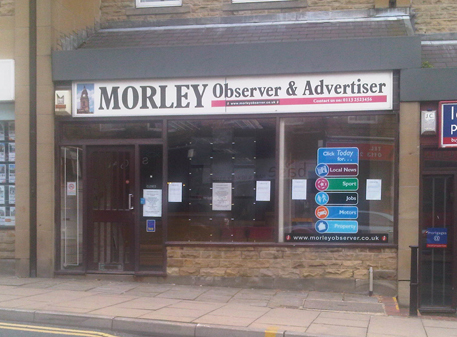 Staff at the Morley Observer and Advertiser are now based at the offices of sister weekly the Dewsbury Reporter. However the Johnston Press-owned title has come up with an innovative way of maintaining a presence in the West Yorkshire town – by swapping office culture for cafe culture. They are inviting members of the public to come and meet reporters at Cucina, a cafe bar specialising in modern European cuisine. “Every Wednesday anyone will now be able to call into Cucina on Queen Street between noon and 2pm and there will always be a reporter on hand to chat to,” it says. Johnston Press declined to comment, but according to company statements on previous office closure stories, the company has recently undertaken a detailed review of all its local offices. Those which have closed in recent months include the Belper News, Eckington Leader, Eastwood and Kimberley Advertiser, Goole Courier, Epworth Bells, Midlothian Advertiser and Lancaster Guardian. Is it April 1? What a joke. How to alienate readers and cause an irreversible decline in sales. Well done, JP. Why is it a joke? Cost cutting aside, I think it’s quite a good idea. Journalists getting out from behind their desks and amongst the community. Talking to readers face to face and simultaneously supporting a local business. Just remember, this is what journalists used to do, albeit in more licensed premises. Reporters meet contacts in a cafe. What’ll be next? The pub? Outrageous. Hang on a minute – isn’t that what all reporters used to do anyway? Point taken – but the reporters are not based in Morley! There’s just a two-hour window in which people can meet them face to face. And as we know, news doesn’t just happen in one two-hour slot once a week. I don’t think it’s a bad idea at all. It’s still two hours more per week actually getting into the community than reporters normally get due to personnel restrictions. I’m sick of seeing reporters tied to their desks, relying on emails and the odd phone call to gather quotes. This cafe business may have been forced upon them but they could benefit from it in the long run. Nice idea. I fancy chucking back gin and tonics in a boozer myself seeking oblivion while being verbally assaulted by the local bores. Funny how senior executives at JP justify their fat salaries by re-inventing the wheel. I did this in the Eighties in a pie shop and all I got was much fatter. By the way, how do the cafe reporters find time when they are usually chained to a desk filling shapes on the wretched anti-journalism Atex system. Wonder who’s footing the bill for all those brews? Given all the bribery stuff at the Met, JP should make also sure the boys in blue stick their hands in their own pockets if they drop in for a cuppa. It’s great that they’re actually being encouraged to meet people face to face. Perhaps JP should consider merging with Punch Taverns or one of the struggling pub companies. Come to think of it, didn’t some newspapers have their origins in the coffee houses of yesteryear? if I was a desk-bound reporter (as so many are these days) I’d jump at the chance to get out of the office and meet people. This whole ‘face-to-face’ thing could catch on. They’ll be telling their reporters to go knocking on doors next…..
Oh dear HTFP has swallowed the company line on this one. This story should have read – more cost cutting by JP in a bid to boost the bottom line. Point taken about reporters getting out and about to meet their public, but the wider point here is more local newspaper offices are being closed and reporters are having to be based several miles away from their patch. Not good in anyone’s book. I also can’t imagine Mrs Miggins or any of the newspaper’s traditional readership calling into “Cucina” with their stories. Can you? It’s also a sure fire bet the JP reporters won’t be regularly enjoying “modern European cuisine” on their lunch hours, based on the salaries the company pays. More likely, a sandwich from the local Morrisons. And why are reporters desk bound, Davy Gravy? Because they have to be all things to all men under the Atex system – reporter/picture finder/sub editor and proof reader. If reporters couldn’t find time to go “off diary” in Morley, how come they’ll find time when in Dewsbury? It’s dressed up nicely by JP as a chance for them to meet people, but they could have met them much more easily by popping out of their Morley office into the town centre when the need arose. You can’t hear sirens/see plumes of smoke when you’re five miles away in another town. Sadly, they’ll also miss all those wacky little snippets by being based elsewhere. This is just a pathetic attempt to put a positive spin on a bad story by JP. Sure, reporters are being freed from their desks – but back in the day, a newspaper would have had enough staff and resources that reporters could leave the office and meet people in a local cafe if needed, while still having a 24/7 base of their own in the form of an office. It wasn’t either/or – they didn’t need to rely on two hours in a cafe every week in order to spend time on their patch. Not very innovative though, Your Leek Paper and Uttoxeter Advertiser have held weekly meetings at cafes in their respective towns ever since Iliffe destructively decided to close their offices in 2009. It’s a great way of meeting contacts face-to-face, but is only necessary because of Iliffe’s short sighted, cost cutting measures. If I was a reporter on that patch I would be based in my bed watching Jeremy Kyle on television and telling my desk I was ‘out and about’. So where are these geniuses expected to meet for conference or to exchange ideas or to go through copy with the juniors. It is an outrageous crock of sh*t to suggest removing offices will get their reporters out in the community. Good reporters already ar, you management twonks. JP reaps what it sows and should be out of business by Christmas. And you wonder why JP’s share price is hovering at 5p when 10 years ago it was 230p! After JP closed It’s office, the Belper News now has a ‘community box’ at the local newsagents where the poster says you can “leave any news stories and competition entries”. A reporter also goes into the town for a couple of hours one day a week from their new base in Ripley. A far cry from the days when there used to be reporters in Belper every day. It is difficult to think of another supposedly professional industry that would consider basing staff in a caff. If the local office hadn’t closed, and this was a way of meeting more readers with stories to tell, it would be a good idea – and in fact has been done many times by many papers. I know the reporters are trying to put the best gloss on bad news but really, what an embarrassing joke this business has turned into. What the story doesn’t tell us is whose idea this was. Betcha anything you like it came from the newsdesk, not the management! Well, exactly right, Glad. This is not some great corporate conspiracy. At the end of it all will be a news ed who is re-packaging someone else’s idea (no harm in that) to try to keep some hooks in the community. If it happened to me, I wouldn’t try to dress it up as “innovative” or anything special. I’d rather have my office back. I’d just quietly get on with trying to gather news as best I could with the resources available – I’m sure that’s what they are doing. at least PieInThe Sky shows some black humour. The new JP boss is going to need all the humour he can muster when he realises what he has to work with- and I don’t mean factory floor staff like reporters. Can’t believe how gullible some of the comments here are. Bet the corporate bods in all the major newspaper companies are rubbing their hands reading them. This is not some jolly to a cafe to meet contacts. This is a cynical move to cut costs – packaged up to look like an old-school ”go out there and get your stories” type plan. Some of you older hacks, reminiscing about meeting contacts in the pub, do you realise this journos are now left without a proper office?? Yes, offices, remember them. Where you lot used to go and sober up – then occasionly write a story. New hacks have it harder these days. Don’t let anyone tell you otherwise. What happened to the pub ? That’s where we old timers got many real stories. Not trotting off to the sandwich shop to pick up supplies for lunch at the desk. The Knutsford Guardian has been meeting readers for some years at outside venues. Better still is to get out and about on your patch and find stories. There are dozens out there for those who keep their eyes and ears open. There is nothing like throwing a reporter into the deep end with a demand he brings back a tale. It certainly sharpens up a nose for news ! I suppose the problem today in the all electronic world and bean counters, one man (or woman) is expected to do the work of perhaps ten. Any reporter worth their salt would use those two hours to sniff out stories, not wait for them to be served up in a greasy spoon. It’s what we did – cultivate contacts – before press release journalism. How about all the fat cat Editorial and Advertising directors and JP executives being ousted out of their Ivory Tower offices (especially the Yorkshire Post offices in Leeds) and setting up in the local Costa Coffee shops. They could boast how they have a network of offices (albeit piggybacking on another company name) This would save millions in running costs and rents and all the freehold offices up and down the land could be sold off to developers. Thanks fat cat JP Executives my idea is patented…I now qualify for massive cost-saving bonus. Cash only please, the shares will be under 1p by December. If you all think JP are guilty of something here I suggest you get together and start your own news operation. It would be interesting to compare notes in 10 years time and compare your readership and number of titles against JP’s. The news industry is being squeezed harder than ever, the public have less money, advertisers have less money and paid-vs-free has an obvious conclusion. GET REAL! I’m no fan of JP or other regional news publishers (TM, etc) but if you saw the balance sheets you’d be running a mile, not trying to keep the business afloat. Sadly Richard North Yorks is right. JP and a lot of other newspaper companies are up the creek with a desperate shortage of paddles. And yes, things are much harder for all hacks now compared to 80s and 90s because they are far too few of us to do a decent job. The last 20 or 30 years was (mostly) a great time to be a hack, but it’s over. For ever. We have to learn to play the game another way- standards might often be lower and the working environment close to intolerable, but that’s the way it has to be unless there is some huge revival in interest in papers and a surprsie uplift in the ailing national economy. Another of JP’s madcap schemes to improve the bottom line, but does it? We keep hearing about the hard times in the newspaper industry, but it only seems to be the JP industry. The independant local newspapers like Barnsley Chronicle are doing well and even expanding into the voids left by the JP madcap failures. Shame on HTFP for just regurgitating the JP line – a couple of hours to replace an office open 9-5 five days a week? Very innovative! Many local papers are no longer representative of the local community they serve – many weeklies are put together by little more than trainees with little experience and no genuine investment in the communities that they serve. Genuine community reporting, where a reporter was seen to be a part of the community they serve, seem long gone. What will be more interesting, if HTFP dares to report it, is how successful (or not) the scheme ends up being. Er, there is no JP ‘line’ on this story. If you read to the bottom you will see the company declined to comment on it.